We offer progressive veterinary medicine in a modern facility with state-of-the-art medical equipment and treatment options. We provide in-house surgeries, a full range of diagnostic laboratory services, and a complete pet pharmacy. At County Line Veterinary Hospital, we are dedicated to taking care of your pet family. Our veterinarians are some of the finest in the area. 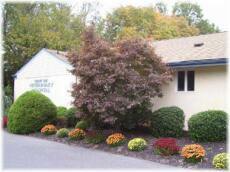 County Line Veterinary Hospital offers you and your pet high quality, affordable veterinary care and surgery. We stress preventative medicine to protect your pet from potential health problems. We also provide pain management to ensure that your pet will enjoy the best possible quality of life. County Line Veterinary Hospital is dedicated to helping our four-legged friends maintain a long, healthy and happy life! Dr. Weitzner has been practicing veterinary medicine since 1981, focusing on Small Animal medicine and surgery with interests in dentistry and ear disease. He received his B.S. in Animal Science from Penn State in 1975 and his VMD from The University of Pennsylvania in 1981. A family man, he has five children and four grandchildren, so far. Dr. Weitzner enjoys spending time with his wife, children and grandchildren. He loves outdoor activities including camping, skiing, white water rafting, snorkeling, occasional scuba diving and jogging. Always eager to learn more, he attends continuing education whenever possible, even on his one day off a week. An alumnus and BIG Penn State fan, he attends football games when possible. Dr. Weitzner's dog, Merlin, goes to work with him every day and is well-known to his clients. Dr. Rosenberg is a graduate of Gregorio Aranteta University Foundation where he participated in an accelerated 6 year educational program and has been practicing veterinary medicine since 1987. He takes every opportunity to attend continuing education classes and has a strong interest in small animal medicine, specifically endocrinology. Since August 2013, Dr Rosenberg has been spending his day off at The Animal Orphanage of Voorhees as their staff Veterinarian. He has found position both rewarding and soul enriching. Dr. Rosenberg is very active in his synagogue and enjoys reading legal novels and medical mysteries in addition to being an avid poker player. He and his wife, Debbie, have two lovely daughters who enjoy coming to the office with him during school breaks to help with projects around the hospital. They share their home with their dog "Bella" and two cats "Oreo" and "Rosie". Kristy has an Associate Degree in Science and is a graduate of the Harcum College Veterinary Technology program. She joined County Line in May, 2006 and is a Certified Veterinary Technician. Kristy is our Head Technician and does everything from assisting our doctors with exams, to dental cleanings all the way to assisting in surgery. When Kristy isn't working, she enjoys spending time with her daughter Avery, shopping, reading, going out to eat and spending time in LBI laying on the beach. Danielle joined County Line in August 2012 after volunteering for the summer. She just completed her freshman year at LSU. She loves working with animals, both small and large, and has always had a huge passion for animals. She is gaining the knowledge and skills to help her achieve the ultimate goal of becoming a veterinarian, working with small and large animals. She thinks waking up every day to go to work with animals is amazing and wouldn't want it any other way!! Riding horses has been one of her passions since she was young. 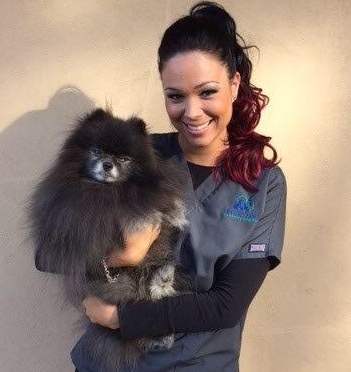 Tina started working at County Line Veterinary Hospital in October 2013. She is currently attending Rowan University for a degree in Biological Science in order to attend a Veterinarian Technician school. 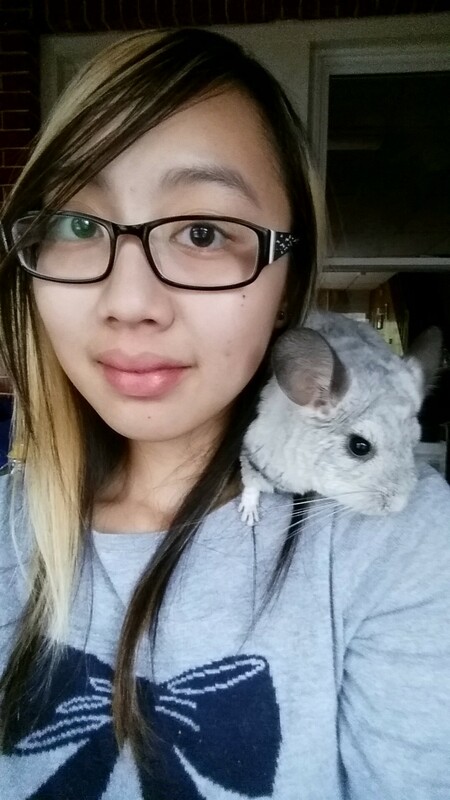 She does a lot of pet sitting on the when she's not at school or working. During her free time she likes to cuddle in bed with her chinchilla, Moo Moo, and watch T.V. or read a book. 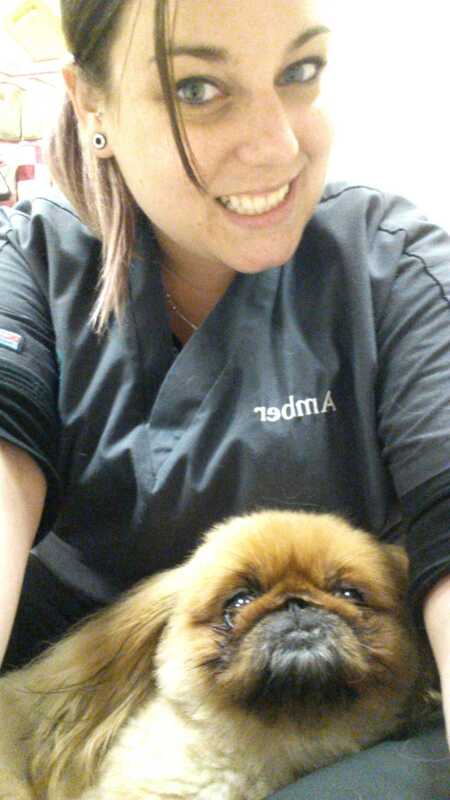 Amber joined our practice in August 2013 and has been a Veterinary Technician since 2008. She is currently attending school to become a registered nurse for pediatric oncology. Her skills include assisting in surgery, performing dental procedures, and performing diagnostics, such as radiographs, blood work and electrocardiograms. Her favorite part of her job is assisting in surgery and dental procedures. She has 2 Labradors (Cocoa and Dexter), a cat (Jasmine), and a snake (Monty). In her spare time, Amber likes to go to Ocean City or take her dogs to parks. Brynn joined Heritage in June of 2011 as a Veterinary Technician. Her primary responsibilities include assisting the doctors with examinations and surgeries, collecting laboratory samples, and taking radiographs. Brynn has been working with animals as a technician for over five years. When she is not working, Brynn spends most of her time with her husband Ken, who she recently married in October, 2011. The rest of her free time is spent with her family and friends, as well as her two dogs -- Gianna, a Chihuahua, and Duke who is a Puggle. Additionally, Brynn enjoys coaching cheer leading, shopping, and laying out at the beach.